In the Irish Sea, off the northern coast of Wales, black-and-white razorbills spend much of their lives floating on the ocean’s surface. As they drift, their bodies rise and fall with the tides, waves, and currents. New research by Matthew Cooper, of Bangor University in Wales, and colleagues shows that by tracking the movements of the seabirds, they can map the motion of the sea. The discovery is an intriguing new way to measure currents and tidal flow, information that is vital to the marine renewable energy industry. The bird-based tracking approach contrasts with traditional methods for measuring tidal flow, which involve radar, or buoys and anchors equipped with scientific instruments. These techniques are highly accurate, but they’re expensive and logistically challenging. The tracking method is still too new to have been put to industrial use, but it has caught the eye of John Reynolds, the technical director for North Wales Tidal Energy & Coastal Protection. Reynolds says the approach would be a useful supplement to other existing techniques. The discovery that the birds’ movements could be used to track the currents and tides came about when Cooper and his colleagues realized this valuable information was hiding in plain sight. Between 2011 and 2014, scientists from Britain’s Royal Society for the Protection of Birds (RSPB) attached tracking devices to razorbills from a colony near Puffin Island, along Wales’s northern coast. 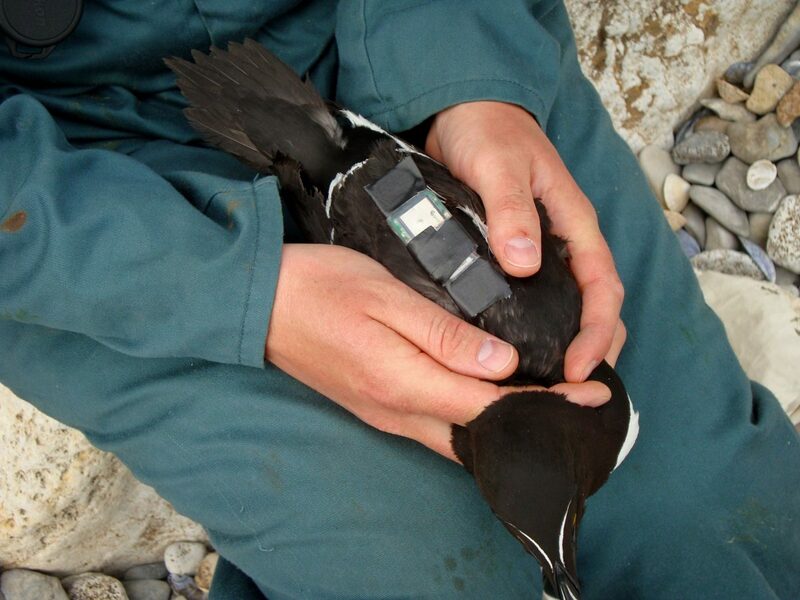 The palm-sized devices are designed to measure seabirds’ distribution, as well as feeding and breeding habits. When Cooper and his colleagues reviewed the RSPB’s data, they realized that the tracker-outfitted birds were indirectly measuring the tide and the surface currents. After filtering out tracking data of birds in flight, Cooper’s team compared the birds’ movements on the water to other tidal flow measurements, confirming that the two coincided closely. They showed that when the birds were drifting, their movements would change direction with the times of high and low tides. Cooper acknowledges that the bird tracking method is not perfect. The razorbills are free to move as they wish, and they can paddle against the tide and current at will. Because they sit on top of the water, the razorbills’ movements also reflect the force of the wind to some degree. 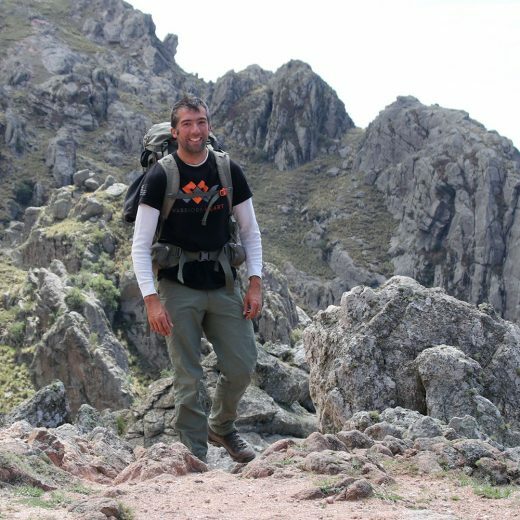 Nonetheless, Cooper says his method is inexpensive and capable of collecting data over a wide area. Cooper says he has no follow-up studies in place, but other researchers are also working to link seabirds’ movements to those of the tides and currents. Cooper’s study provides a clever example of how data from one field can be repurposed to other ends. It seems only fitting if the renewable energy industry could also benefit from this recycled data. Cite this Article: Forest Ray “Scientists Turn Birds into Activity Trackers for the Sea,” Hakai Magazine, Jan 28, 2019, accessed April 23rd, 2019, https://www.hakaimagazine.com/news/scientists-turn-birds-into-activity-trackers-for-the-sea/.